The PRANA® software for polysomnography and biosignal processing has powerful computing capabilities and modularity allowing multiple software plug-ins to be executed efficiently. All the software plug-ins can be executed in a single run by using the software plug-in launcher. Additional plug-ins can easily be implemented using the software developer kit. The software power spectral analysis plug-in allows the study of human and animal brain functions by measuring EEG powers and frequencies using adjustable settings. The software power spectral analysis plug-in of the PRANA® software features state-of-the-art quantitative biosignal time-frequency analysis. Quantitative analysis can be carried out easily and independently of the recording collection system, which allows ensure data from different studies to be compared. The software spectral coherency analysis plug-in allows studying brain functions by measuring EEG temporal-spectral coupling between different brain areas. Thanks to the software spectral coherency analysis plug-in, the PRANA® software provides an analytical capability with an adjustable temporal resolution of the spectral coupling between biosignals. The software feature extraction plug-in allows for biosignal time-varying analysis by extracting from the signals any mathematically defined features. With the PRANA® software feature extraction plug-in, temporal analysis of any biosignals using any mathematical function can be performed. New signal processing features can thus be easily implemented and evaluated by the user. Software functions for biosignal feature extract: absolute and relative powers; mean and peak frequencies; correlation dimension, spectral, sample, approximate, Shannon and Tsallis entropies; Hjorth activity, complexity and motility; statistical descriptors such as minimum, maximum, sum, difference, mean, median, standard deviation, variance, skewness, kurtosis and slope; wave peak and root-mean-square amplitudes, inflexions and zero-crossings. 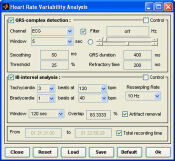 The software heart rate variability analysis plug-in allows the study of human and animal autonomous nervous function by detecting heartbeats from any ECG signal and measuring heartbeat intervals variability using standard methods. direct compatibility with various cardio-frequency meters. With the software heart rate variability analysis plug-in, the PRANA® software allows for high-quality HRV analysis independently of the recording system. The software oxygen desaturation analysis plug-in allows to study the level in human and animal of blood oxygen saturation. It enables using adjustable settings the detection of phases of desaturations from signals derived from pulse oxymetry. After a prior artifact-processing step, the software plug-in detects phases of oxygen desaturation with an accurate localization of their onset, offset, peak and through. The software plug-in then extract time-varying averaged measures of oxygen levels and desaturation phases on an epoch-per-epoch basis. The software oxygen desaturation analysis plug-in together with the PRANA® software allows for high-quality cardio-respiratory analysis independently of the recording system. The software cardio-pulmonary cycle analysis plug-in allows the study of human and animal cardio-pulmonary and autonomic functions. It enables using adjustable settings the detection of cycles from any oscillatory signals such as respiratory flow, effort, pulse and arterial pressure captured from various sensors. After a detection of cyclic phases onset, offset, peak and throughs, the software plug-in extract time-varying averaged measures of cycles amplitude and frequency on a epoch per epoch basis. The software event series analysis plug-in allows the study of human and animal event distributions and event associations. It enables using adjustable settings to match multiple analysis requirements. Whether resulting from manual scoring or automated detection, the software plug-in extracts time-varying average measurements of event distribution and association on an epoch-per-epoch basis. user-definable settings and quick regeneration of software default settings. The software event series analysis plug-in together with the PRANA® software allows for high-quality analysis of event distributions and event associations independently of the recording system. The software event waveform analysis plug-in allows the study in human and animal of the signal waveform and signal characteristics related to any given type of spontaneous or evoked events. It enables using adjustable settings to match multiple analysis requirements. Whether resulting from manual scoring or automated detection, the software plug-in extracts the event-related waveforms and extract multiple features on an epoch-per-epoch basis. cross-signal feature extraction to derive information extracted from differents signals such as sleep/wake score, average hear rate, pulse rate, respiration rate, etc.. The software event waveform analysis plug-in together with the PRANA® software allows for high-quality analysis of event-related signals independently of the recording system. Page under construction, please check back later. *Compatible only with specific recording settings. Validity test required.